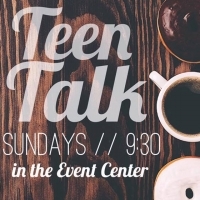 You DO-NUT wanna miss Teen Talk class Sunday mornings at 9:30! 🍩 ☕️ 🍩 ☕️ 🍩 we're looking forward to hanging out with you and digging deeper into God's Word with you! It will be worth getting up just one hour earlier 😉 you can do it! !